The intersection of local environments and global mobility transformed Maitland, Nova Scotia, and many other small villages on the Bay of Fundy into boomtowns between the 1860s and the 1880s. Maitland’s location at the mouth of a river flowing into the Bay of Fundy, along with an abundant supply of spruce and a growing global demand for the low-cost transportation provided by large wooden sailing ships, facilitated the rising economic importance of this village and the region. Unlike other products that galvanized much of the Canadian extractive economy in the nineteenth century, Maitland’s spruce trees were not shipped to Britain as raw lumber. Instead, local businessmen and labourers transformed them into inexpensive sailing ships for transporting bulk commodities around the globe. Maitland’s rise as a shipbuilding centre coincided with a golden age of resource-led global economic development. As the cost of mobility decreased significantly, the mass transfer of raw materials, manufactured goods, and people around the world led to dramatic social, economic, and environmental change. The carrying capacity and number of sailing ships in the world reached a pinnacle during the second half of the nineteenth century. While new technologies such as iron hulls and steam engines were beginning to revolutionize global mobility in the mid-nineteenth century, they remained too inefficient and expensive for use on many longer-distance routes. It was not until the last decades of the century that steamship technology reduced fuel consumption and increased the scale of iron vessels to the point where sailing cargo vessels became increasingly redundant. The global shipping industry continued to demand large wooden ships through to the 1880s. This global context allowed Maitland’s shipbuilders to amass significant fortunes by transforming local softwood forests into ships. These builders could either sell the ships to merchants in Halifax or Liverpool, or retain ownership and bid for contracts to transport commodities such as guano from Peru to Europe and coal from Cardiff to Okinawa. They relied on the improved communication networks facilitated by regular travel across the North Atlantic and a growing matrix of telegraph cables. Reliable information was arguably the most valuable commodity in the nineteenth century, and the new mobility of commercial intelligence facilitated Maitland’s participation in a globalizing economic world. Although much of the historiography of rural Nova Scotia in the mid- to late nineteenth century emphasizes a culture of “persistent localism,” or smaller-scale networks anchored in a North Atlantic “rural-urban space economy,” we suggest that the evolving global economy mattered in places like Maitland. Looking at a relatively tiny and isolated community in the upper Bay of Fundy demonstrates how new ideas, commodities, and transportation technologies briefly reshaped the development of Atlantic Canada in the mid- to late nineteenth century. Likewise, we can see how, by this time, industrialization had come to fully encompass manufacturing centres, resource frontiers, and even small isolated rural communities like Maitland, Nova Scotia. By situating the history of a local environment and community within this much broader context, this chapter demonstrates the rich promise of the mobilities framework and calls for similar studies of local histories situated in their global historical context. By the middle of the nineteenth century, small-scale shipbuilding around the Bay of Fundy had blossomed from pre-existing agricultural and resource-based economies. In Kingsport, on the Minas Basin, the industry developed alongside a boom in potato exports from the nearby town of Canning. In Bear River and Weymouth, near Digby, where semi-subsistence farming anchored people to the land, the growth in shipbuilding coincided with a rise and development in the lumber industry. In Maitland, shipbuilders capitalized on a pre-existing regional economy built on mineral exports, which connected the village to larger ports such as Saint John, New Brunswick, and Boston, Massachusetts. In these and many other small communities around the Bay of Fundy, local economic development was accelerated by the outbreak of the American Civil War in 1861, which brought lower insurance rates and competitive advantage for ships sailing under neutral flags. News of this economic opportunity spread quickly — likely through Saint John and Windsor, Nova Scotia — to these remote villages. The movement of information through a regional network provided the impetus for small-scale shipbuilders to take risks and build their first commercially oriented ships. With these ships, Bay of Fundy shipbuilders gained contacts with shipping agents and shipbuyers in the United Kingdom, opening a door to the global shipbuilding and commodity trade. There is little doubt that these trends were broadly reflected in Maitland. And yet when we look at life in this village during the 1860s, 1870s, and 1880s, it is clear that the village’s entrance into large-scale shipbuilding and shipping broadened the horizons of Maitlanders. During this period, the village emerged from a regional trading network anchored around the Bay of Fundy, into a global commodity network based out of cities like Liverpool, London, Antwerp, and New York. The scale of the shipbuilding industry grew substantially, both in the size of the ships and in the number of ships built. Likely because Maitland was relatively isolated from larger Nova Scotian towns, the industry drew hundreds of people to the Maitland region and transformed the local landscape; shipyards consumed forests of spruce as farmers cleared more and more land to feed the burgeoning population. Once the ships left Maitland, they continued to contribute to the transformation of numerous distant landscapes, as they carried bulky raw materials from dispersed commodity frontiers to European centres. The reduced cost of global transportation allowed for the significant expansion of complex networks of commodity chains for a growing range of natural resources and agricultural products throughout the nineteenth century. large number of small coastal ships for transporting gypsum during the middle decades of the nineteenth century, though none of these ships appear in the shipping registries. While Maitland slowly developed as a farming hamlet, gypsum-mining region, and site of small-scale shipbuilding, a group of businessmen dreamed of making it a key location in Nova Scotia’s first major transportation project. The ill-fated Shubenacadie Canal connected the Bay of Fundy to Halifax through a series of rivers and lakes, and Maitland was well located at the canal’s mouth. A map from 1828 charts the future course of the canal, highlighting the valuable resources located along its route. The GIS map in figure 1.1 shows that the surveyors found stands of hardwoods, thousands of acres of ship’s timber, and riverbanks full of gypsum and limestone.16 Unfortunately, lengthy delays and competition from the Nova Scotia Railway led to the failure of this canal even after its eventual completion in the 1860s. Maitland never became a central hub in Nova Scotia’s canal transportation network. Some early ships were built to transport gypsum, the mining of which was one of the more important export activities from the Bay of Fundy region during the early decades of the nineteenth century. Demand for the mineral as a fertilizer increased in markets along the Eastern Seaboard. A grey market for gypsum flourished around Passamaquoddy Bay, on the Maine and New Brunswick border. Local settlers used small boats to carry gypsum down the Bay of Fundy to larger American vessels waiting near the border and thereby avoided paying duties. This trade was an integral part of a burgeoning transportation network around the Bay of Fundy. Small ships traded gypsum for finished American goods, which merchants then sold in the small communities scattered along the bay’s shores. The gypsum trade helped link the Maitland area with Boston, Windsor, Saint John, and other ports in this regional network. Gypsum extraction fuelled the early development of shipbuilding around Maitland, as gypsum trading reached its height during the same period in which Whidden and Campbell apparently started building ships. In 1860, Maitland produced 23,668 tons of gypsum, making it the largest gypsum-producing community in the province other than neighbouring St. Croix and the Kempt Shore, also in Hants County. In the decades that followed, the Hants County gypsum industry continued to expand almost as rapidly as the shipbuilding industry. Although a correlation existed between the two, by the 1860s many of the ships built in Maitland did not participate in this regional trade. Instead, they deployed in the global commodity trade. The shipbuilding career of W.D. Lawrence serves as a useful illustration of the transition from small regional shipbuilding to full engagement with the global transportation market. Born on July 16, 1817, in the north of Ireland, he was the oldest son of William Dawson Lawrence and Mary Jane Lockhart. Family pressure following his father’s decision to wed a woman from a less-affluent class forced his parents to leave Ireland. They took their infant child and travelled to Nova Scotia, where they eventually acquired a farm in Five Mile River, located about fifteen kilometres from Maitland. At the age of nineteen, the younger William Lawrence left the farm and began to visit shipbuilding centres on the Atlantic coast. He first travelled to Dartmouth, across the harbour from Halifax, in order to study the trade; he worked long hours, learning his craft from the keel up. Ambitious to succeed, he enrolled in classes at Dalhousie College in 1838, the school’s first year of operation. 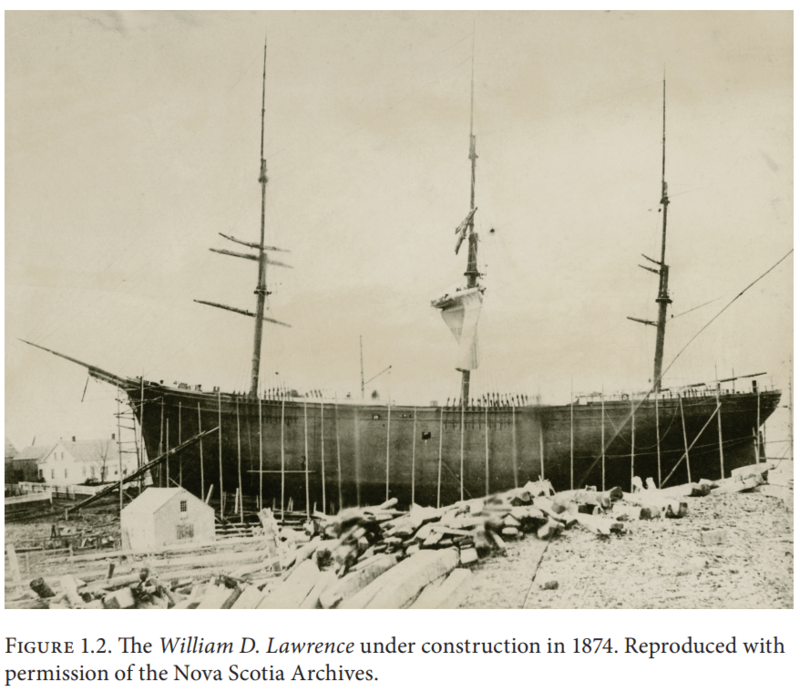 During his time in Dartmouth, Lawrence learned a great deal about building ships. However, the training available in Nova Scotia had its limits. Lawrence needed to go farther afield if he wanted to learn how to design his own ships rather than just build them from someone else’s plans. To that end he went to Boston in order to study drafting under Donald McKay. McKay, originally from Shelburne, Nova Scotia, had made his name designing clipper ships, and he proved willing to help a fellow Nova Scotian. In 1847, Lawrence returned to Dartmouth, where he designed the 568-ton Wanderer, which was built for the Halifax firm Fairbanks and Allison. Throughout the decade or more that Lawrence spent moving between home, Dartmouth, and Boston, he learned the shipbuilding skills, which became essential when he returned to the Maitland region in the early 1850s and built his own ship, the 170-ton St. Lawrence brigantine. Unlike a conventional commodity frontier—where outside capital flows into commodity-rich landscapes and both the environment and local populations are exploited to accumulate metropolitan profits — the Maitland industry developed locally, first becoming integrated within regional shipping industries and later within global trade. Small-scale entrepreneurs, led by Lawrence, capitalized on the low cost of timber to enter the shipbuilding and shipping market while retaining local control of the means of production. For example, Lawrence owned the St. Lawrence in partnership with two of his brothers and another local shipbuilder, Alexander McDougall. Clearly, as was common at the time, they needed to pool their small amounts of capital to start building increasingly larger ships in this region. The fact that Lawrence kept building and owning boats, and that over time he was able to retain larger and larger shares of the ships’ ownership, suggests his early vessels were profitable. Although shipbuilding remained a secondary industry in the Maitland area through the 1840s and 1850s, Lawrence’s decision to move his operation to the shore of the Shubenacadie River acknowledged the prospects for the industry in this well-forested landscape. One list of ships built in the region indicates that only six vessels were built and registered in the 1840s and eight in the 1850s. Significantly,though, builders increased the size of vessels. Specifically, the average tonnage in the 1840s was 71; in the 1850s it doubled to 141. In 1854, Lawrence and his partners purchased 4.85 hectares (twelve acres) of land on the edge of the village of Maitland, where they operated their new shipyard. Lawrence later bought out McDougall to become sole owner of the shipyard. He built two more ships during the 1850s: the Architect in 1856 and the Persia in 1859. By building and operating these ships, Lawrence demonstrated the competitive advantages and profitability of shipbuilding on this remote shore of the Bay of Fundy. In the decades that followed, Lawrence joined a broader regional trend of building large ships using widely available and inexpensive red spruce from around the Bay of Fundy. While wooden ships were traditionally built using hardwood, such as oak and teak, the large spruce softwood trees that grew in New Brunswick and Nova Scotia provided a functional, local, and significantly cheaper alternative that did not draw on the commercially valuable lumber used by the timber industry. Spruce also gave vessels greater buoyancy, allowing them to carry greater loads. In 1864, W.M. Smith, the controller of customs and registrar of shipping in New Brunswick, extolled the virtues of spruce from the Bay of Fundy for vessel construction: “The experience of some of our [New Brunswick’s] wealthiest shipowners appears to be in favor of a well built, bay spruce salted ship, as a profitable investment, as such vessels have been known to be running from and to all parts of the world for twenty or thirty years in good condition.” While technological innovations transformed some sections of the shipbuilding industry, Smith explained that two spruce ships could be built and outfitted for the same cost as an iron sailing ship of the same size. The Maritime colonies were particularly well positioned to take advantage of the growing market for transatlantic shipping because of their proximity to the Eastern Seaboard, lower labour costs, and abundance of spruce forests. Local environmental advantages, along with the American Civil War, enabled the shipbuilding boom in Maitland. The major rivers feeding the Bay of Fundy served as ideal locations for building large wooden ships for the deep-sea trade. Most of the major shipbuilding centres on the Minas Basin were located on either the Avon or Shubenacadie rivers, in Kings and Hants counties. There were four advantages to these locations. Most importantly, the Bay of Fundy’s funnel shape creates the highest tides in the world, making it easy to launch large ships built along these estuaries. Thus the capital investment required for shipbuilding was kept very low, obviating the need for any kind of dry dock. Maitland shipbuilders simply built the boats on the beach near the high tide line and relied on one of the particularly high monthly spring tides in the early spring or late fall to carry their ships out to sea. These rivers also offered a sheltered harbour, protecting shipyards from unfavourable Atlantic storms. Furthermore, the waterways served as reliable routes by which to transport wood from the forest to the shipyard. The predominantly spruce forests along these riverbanks provided abundant raw material. Maitland’s mid-century economy had not developed as much as that of Windsor and Hantsport on the Avon, so shipbuilders along the Shubenacadie’s shores had access to more abundant forest resources. The 1860s witnessed a considerable change in the fortunes of this small community. At least thirty-four vessels were built over the decade. New vessels continued to include increased carrying capacity, reflecting the growing interest in transoceanic trade. Lawrence led the expansion of Maitland’s industry through his engagement in the deep sea shipping market. He managed a small shipping business with the Architect and the Persia in the late 1850s. In 1861, he sold these ships and prepared to build a significantly larger ocean-going vessel. A year later, he built the 762-ton William G. Putnam and, the following year, the 642-ton Mary. Lawrence became a local leader, as he continued to build larger vessels and set a profitable example by retaining ownership of his ships. It is likely that during the early 1860s he connected with an agent in Liverpool, tapping into a network that brought his vessels to ports all over the globe. As Lawrence developed his ties with this global network, the scale of Maitland’s shipbuilding industry expanded significantly. While some shipbuilders continued to build smaller regional trading vessels with low tonnage, a few individuals aspired to build large deep-sea vessels. On the regional level, these shipbuilders followed those in the larger shipbuilding centres at Windsor and Hantsport, where ships over one thousand tons were already being built by the early 1860s. On a more local level, Maitland shipbuilders T.S. Harding, Robert Boak, A. McCallum, and T.S. Trefrey followed Lawrence, building vessels larger than five hundred tons in the years after 1862. A few years later, in 1867, Lawrence built Maitland’s first vessel over one thousand tons, the 1,020-ton Pegasus. Charles Cox built two more vessels over a thousand tons in the following years. By the beginning of the 1870s, as the tables below indicate, Maitland had emerged as a regional leader in large deep-sea vessels. Maitland’s shipbuilding began during the American Civil War, boomed in the 1870s, and continued through to the early 1880s. 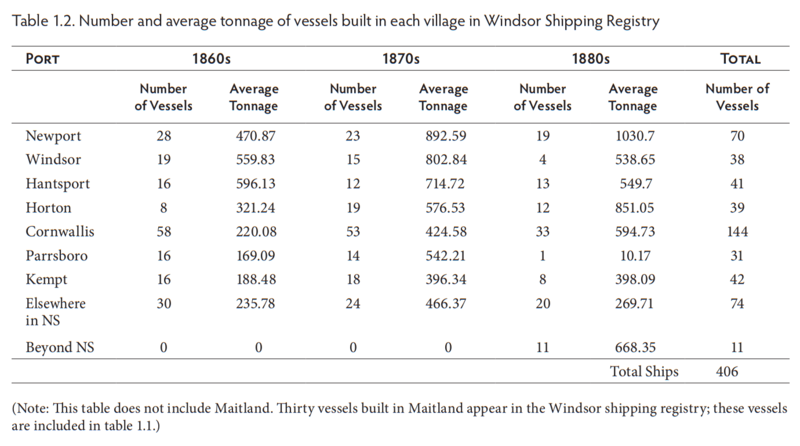 Table 1.1 demonstrates the sheer dominance of large deep-sea ships built in Maitland during the 1870s and 1880s. Although the overall number of ships declined during the 1880s, the average tonnage decreased only slightly. Comprising just 6 percent of the ships built at Maitland in the 1860s, the ratio of vessels larger than one thousand tons grew to just over 50 percent in the 1880s. 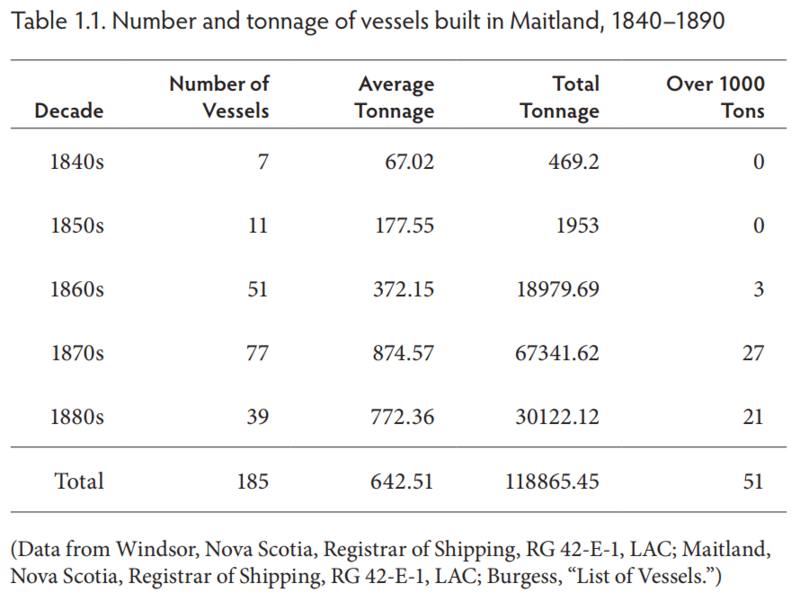 Table 1.2 shows that when compared with other shipbuilding centres along the Bay of Fundy’s shores, Maitland was one of the leading shipbuilding centres in the region. The village’s volume of production dwarfed that of many other locations. The boom in shipbuilding brought about an increase in Maitland’s population. Between 1860 and 1870, the village population increased by 25 percent, from 1,967 to 2,463 people. Housing stock jumped even more significantly in this period, from 295 inhabited houses to 410, an increase of 38 percent. Most of this migration came from other parts of Nova Scotia. Local memory also suggests a certain degree of seasonal migration, as workers moved to Maitland during the summer months to help build the vessels. Unfortunately, the 1861 census lacks information about land holding, so it is difficult to assess the impact of this movement on the local landscape. The overall acreage in 1870, however,suggests that residents had cleared about half the land on the southwest side of the river, shown in figure 1.3. They no doubt used the trees for vessels, home construction, and fuel. The building of the Pegasus in 1867 provides a glimpse into the nature of this industry. This is one of the few years for which Lawrence’s correspondence has survived. His letters demonstrate the importance of the shipyard to Maitland’s economy, the significance of ship owning for Lawrence’s career, and the network of relationships that Lawrence needed in order to actively participate in the global shipping industry. The building of the Pegasus required Lawrence’s full-time attention. In his letters, he regularly mentioned that he could not leave Maitland, because he had fifty men building his new ship. While the spruce used on this and other Maitland ships was harvested locally, he ordered oakum, spikes, and other supplies from Black Bros. in Halifax. The iron knees and the masthead came from Saint John, and a steamer towed the ship to this larger port to complete the final outfitting after it launched. With the vessel seaworthy, Lawrence put his shipbuilding activities on hold and focused on the engagement of the Pegasus in the deep-sea shipping trade. At the same time, Lawrence — a leading opponent of Confederation — continued his heavy involvement in provincial politics. His ability to leave his shipyard fallow for a number of years as he accumulated capital with his new ship and continued his fight against Confederation demonstrates the low levels of fixed investment and the pluralistic nature of work in these Maitland shipyards. Lawrence’s letters show that his involvement in global trade networks hinged on shipping agents and capital from Liverpool. Lawrence relied on his agent, J.C. Jones, to help finance construction of the Pegasus and to secure a series of shipping contracts. Between 1867 and 1874, these contracts took the Pegasus on very profitable trips around the world, to cities including St. George, New Brunswick; Boston; Liverpool; Antwerp; Yokohama; Callao, Peru; and Montevideo, Uruguay. Lawrence remained in close communication with Jones and with Jones’s successor, A. Gibson, over the course of the vessel’s construction and subsequent voyages. The limited sample of Lawrence’s letters preserved in the archives include twenty-two letters to Jones, written between June 1867 and May 1868, and a further twenty-four letters to Gibson, written between September 1868 and May 1871. For over a decade Lawrence’s shipbuilding activities paralleled his political involvement. In 1863, he was elected to the Nova Scotia Legislature as a Liberal Conservative member for Douglas (now known as Hants North), joining his close ally Joseph Howe, who also represented the dual-member riding. They later split over the issue of Confederation. Marvin Moore argues that Lawrence’s opposition to Confederation stemmed from his concern that political union would hurt the Maritime shipping industry. Confederation threatened to reorient the flow of goods and capital in the region, favouring inland interests over the coastal trades. Lawrence worried that Canadian politicians and businessmen would redirect maritime wealth to finance the canals and railroads needed for continental development. Although Lawrence’s pessimism eventually proved true, Confederation was not the most significant cause of Maitland’s decline; indeed, Maitland’s shipbuilding industry peaked in the years after 1867. In the 1870s and 1880s, its shipyards produced more than twenty vessels larger than one thousand tons in each decade. Lawrence built his final vessel during this pinnacle of Maitland’s shipbuilding history. His correspondence from the late 1860s and early 1870s suggest he had made a small fortune by using the Pegasus in the deep-sea trade. He did not need to invest this money in a new and larger vessel. However, after losing the 1871 provincial election over the issue of Confederation, Lawrence returned to the shipyard with renewed vigour. He set out to build “the largest vessel ever placed upon the stocks in the Dominion or in British North America.” The ship that Lawrence built was 262 feet long, 55 feet from keel to rail, and 48 feet wide. Its main mast was 200 feet and 8 inches. It carried 11,500 yards of sail. Its draft (how deep it lay in the water) was 11 feet when empty and 26 feet when fully loaded. It took seventy-five men a year and a half to build the 2,459-ton vessel. The masthead on the aptly named William D. Lawrence was of an old man in a flowing cloak, holding a scroll inscribed with the words “God defends the Right.” Clearly, Lawrence wanted to make a statement with the construction of this massive vessel (fig. 1.2). Having decided to build the ship, Lawrence began to draw on his local and global connections to acquire the many resources necessary to build such a large vessel. He built a three-dimensional model of the ship, and crews began to cut and haul the wood needed. The main material, of course, was Maitland spruce. When the ice had gone out of the river, migrant shipbuilders arrived to commence the ship’s construction. With few other local resources available, everything from oakum to iron needed to be shipped to Maitland from Halifax, Saint John, or Boston by sea and rail. Lawrence had James Ellis, the captain of the Pegasus and his son-in-law, acquire more specialized materials such as chains, anchors, and pumps while that ship was in port at Liverpool. When all was complete, the materials and labour had cost $107,452, leaving Lawrence over $27,000 in debt. At the time, many regarded the building of this vessel as Lawrence’s folly. More than four thousand people descended on the village to see what some were expecting to be a disaster. Yet the ship considered too large to float slid smoothly down the ways in September 1874. The William D. Lawrence safely entered the global deep-sea trade, marking the climax of the village’s shipbuilding days. Demand for vessels like the Pegasus and William D. Lawrence grew as trade in bulky natural resources increased around the world, leading to a golden age in the global commodity trade. The growth of the United States as a major economic power and the decline of its merchant fleet following the outbreak of the Civil War were the biggest factors in creating demand for ships from the Maritimes. Moreover, industrialists seeking to fulfill their ever-growing hunger for natural resources from around the world sought to globalize supply chains, while population growth and urbanization led the British to rely on large amounts of grain and other foodstuffs from around the world. The commoditization of grain, cotton, oil, hides, tallow, guano, copper, and many other raw materials increased demand for transcontinental shipping, both in the heavily trafficked North Atlantic and in developing resource frontiers. Steam technology failed to meet the rising demand of the global commodity trade through the mid-nineteenth century. On many routes it remained cheaper to move goods by sail until the 1880s and 1890s, when steamships became significantly more fuel-efficient. At mid-century, charts predicted global wind patterns more accurately than ever, which increased the speed of sailing ships over long distances, while at the same time steam technology made easier the sailing and docking of large vessels. The growing size of Bay of Fundy spruce ships reduced overall operation costs and allowed these vessels to cultivate a niche in the global shipping market through the 1870s and 1880s even as steamships gained prominence. Maitland sat at the heart of the boom during the 1870s, as Hants County had become one of the new province’s principal shipbuilding centres. Although the county produced fewer vessels than other Nova Scotia ports, the average size of its vessels was over one hundred tons larger than elsewhere in the province. This characteristic reflected the region’s focus on large ship construction and the deep-sea shipping industry. Hants County also led the province in the number and combined value of its shipyards, with eight more yards and $100,000 of greater worth than Digby, the next largest shipbuilding centre according to the 1870–1871 census. For a moment in the 1870s and early 1880s, Maitland and other Bay of Fundy communities engaged with the rest of the world. The Maitland ship registry for the mid-1870s, the 1880s, and the 1890s demonstrates the dominance of British shipping interests, as Maritime merchants sold vessels — both immediately after construction and after years of service — at Glasgow, London, and Liverpool. Perhaps the location where vessels met their demise is more revealing in determining the scope of the trade. Maitland-built vessels sank while en route to or from such places as San Francisco, South Africa, the Bahamas, the Bering Sea, and Peru. During these years, many Maitland families had members who visited these far-off places as sailors, sea captains, and passengers. In his correspondence and an unpublished travel memoir, Lawrence wrote of travelling to cities such as Liverpool, Antwerp, Aden, Bombay, Callao, and Le Havre. Village residents visited places that just a few decades earlier would have been known only through written accounts. Like the Pegasus before it, the William D. Lawrence circumnavigated the world in service of the risky global commodity trade. Even before Lawrence launched the ship, he had obtained charters to carry two cargoes of guano from the Chinchas in Peru to France. To increase the profitability of this long voyage, Lawrence carried lumber from Saint John to Liverpool and coal from Cardiff to Aden, before crossing the Indian and Pacific oceans to Peru. Before the ship arrived in Peru, the guano market had crashed because new chemical fertilizers — cheaper and easier to obtain than Peruvian bird droppings—had come onto the market. The French Dreyfus Brothers firm attempted to cancel the charter, but they could not do so without Lawrence’s agreement. Stubbornly, Lawrence waited eleven months to load the cargo. When the ship arrived in France, the Dreyfus Brothers refused to accept the guano. Lawrence ordered the cargo off-loaded at his own expense and turned the matter over to a French law firm that sued on his behalf for the cost of the cargo and demurrage for the long wait in Peru. Lawrence eventually won the case and received the whole cost of the cargo and demurrage. He retained ownership of his last ship until 1884 and claimed that he made a large profit during these nine years of operation. The success of shipbuilding transformed Maitland by increasing its population and drawing on institutions that could better connect shipbuilders and owners with the global network of their trade. The village’s population peaked in 1880, when the census recorded three hundred more people than it had in 1870. By this time, there were up to twenty shipyards around Maitland. Within the village itself there were seven. With this expansion, a shipping register opened for Maitland in 1874. It provides details on when vessels were built, by whom, and often when these ships ceased their registration after sale or destruction. The register lists fifty-one vessels built during the 1870s, averaging 888 tons. Twenty vessels had a carrying capacity over one thousand tons. In addition, the insurance firm Lloyds hired Lawrence as its local representative. Beyond these shipping-specific institutions, Western Union and the Merchant’s Bank of Halifax opened agencies in Maitland in 1872 and 1873, respectively. The introduction of these institutions reflected Maitland’s growing economic importance, built on its involvement in the global shipping industry. Yet the 1870s were to be the high point in the economic vibrancy of the Bay of Fundy. In the decades that followed, Maitland declined almost as quickly as it had boomed. By 1880 the shipbuilding industry began to stabilize and then fall. Only forty vessels were launched in this decade. Over half of these vessels had carrying capacities of over one thousand tons, with an average carrying capacity of 772 tons. Significantly, though, only five vessels were built after 1885. Even grimmer were the 1890s, when builders constructed only sixteen vessels. The fact that eight of these ships were over one thousand tons demonstrates the continued importance of the deep-sea trade to the village’s economy. The population also began to decline. By 1890, 20 percent fewer people lived in Maitland, and villagers occupied 12 percent less acreage than they had a decade earlier. The region’s shipbuilding potential had linked its natural resources to global commodity flows. This nexus was caused by, and continued to fuel, the expansion of the population and local agriculture, the clearing of local forests, and the extraction of local mineral resources. Trade and shipbuilding also dramatically transformed the local environment. By the early twentieth century, considerably fewer trees remained around Maitland than had stood before this boom in shipping had begun. This was not a unique situation, as little “first-growth” forest was left by this time anywhere in peninsular Nova Scotia. The exact role of shipbuilding in the deforestation is hard to ascertain. At least one mill existed in South Maitland by the 1860s, and the general trend across the province suggests that the forests of Maitland and the Shubenacadie Valley would have fallen with or without the shipbuilding industry. Nonetheless, as early as the late 1860s, Lawrence found it difficult to secure timber for large ships because forest resources had been depleted—a common phenomenon in shipbuilding centres. Wood for shipbuilding became increasingly scarce on Prince Edward Island between the 1840s and the 1860s, as the industry took the best species. A similar pattern likely occurred in Maitland. The fact that Maitland built dozens of very large ships in the 1870s and 1880s suggests they had begun to use forests located farther from the village, moving trees longer distances during the late winter and spring. shipbuilding era even if the global demand for wooden sailing ships had never declined. With much of the landscape categorized as “severe cull” and only a limited section replanted with second-growth forests, the natural advantages of easily available, large spruce trees no longer existed at the start of the twentieth century. Maitland’s brief foray into the global shipping trade made a significant impact on the community. 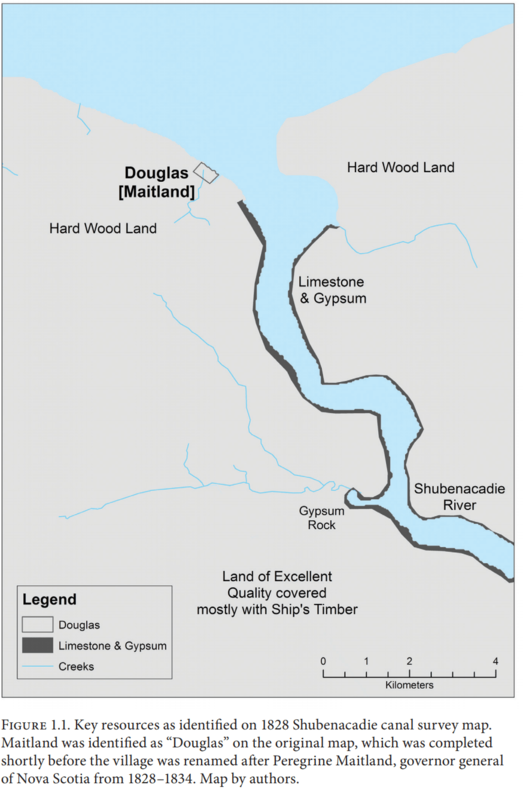 Its geographic location, access to cheap spruce, and abundant gypsum created a foundation on which Maitlanders could profit by selling their ships and labour. The probate records left behind by some of the village’s key shipbuilders demonstrate the wealth that Maitlanders acquired from this trade. However,the amount that these men could make in the trade varied considerably. For example, despite building vessels over one thousand tons, Joseph Monteith and Alexander Roy had amassed only $5,114 and $20,324.50, respectively, by the end of their lives. In contrast, Lawrence and Archibald McCallum had built up small fortunes: $164,423 and $182,817, respectively. Although it is difficult to be certain, it is likely that Lawrence’s and McCallum’s higher degrees of vessel ownership and external investment explain part of this difference. Despite these substantial differences in wealth, all four men had an above-average amount of wealth for the end of the nineteenth century in Nova Scotia. As the industry declined, Maitland remained a relatively well-off small town, living off the foundation created by its foray into global shipping. Maitland’s moment of connection to the global shipping trade created two legacies. First, a small number of shipbuilding families amassed considerable fortunes from this craft, drawing this tiny town into international trading networks. Second, the shipbuilding industry played an essential role in transforming a dense forest into a patchwork of new farms amid a severely culled landscape. Local forests, transformed into large vessels, circumnavigated the globe and rarely returned to the Minas Basin. They contributed to the dramatic decrease in the cost of global mobility during the second half of the nineteenth century. Maitlanders exported local resources and in doing so they facilitated the mass transfer of other raw materials between Europe, Asia, and the Americas. The deforestation that reshaped the local environment affected all of the village’s residents—regardless of class, ethnicity, or religion—and challenges the idea that small and relatively isolated communities like Maitland cultivated a culture of “persistent localism” that focused mostly on developing regional relationships. From a foundation of high tides, easily accessible mineral deposits, and abundant spruce, Maitlanders became mobile, drawing information and profits from regional—and then global—trading networks in order to briefly transform their village into a prominent shipbuilding centre at the end of the nineteenth century. By capitalizing on nearby natural resources, Maitlanders were able to draw transoceanic financial, communication, and transportation networks into their village at the top of the Bay of Fundy. Through these linkages and by building ships out of the abundant supply of local trees, Maitland avoided becoming an exploited peripheral site of resource extraction and instead participated in and profited from the global trade in bulk commodities. Letter to the editor, Acadian Recorder, 27 December 1883. Edward B. Barbier, Scarcity and Frontiers: How Economies Have Developed through Natural Resource Exploitation (Cambridge: Cambridge University Press, 2011), 2–3, 368–428. James Belich, Replenishing the Earth: The Settler Revolution and the Rise of the Angloworld, 1783–1939 (Oxford: Oxford University Press, 2009), 106–44. Gerald S. Graham, “The Ascendancy of the Sailing Ship 1850–85,” Economic History Review, n.s., 9, no. 1 (1956): 75–88. Mimi Sheller and John Urry, “The New Mobilities Paradigm,” Environment and Planning 38, no. 2 (2006): 207; John Urry, “Mobile Sociology 1,” British Journal of Sociology 51, no. 1 (2000): 185–203; Kevin Hannam, Mimi Sheller, and John Urry, “Editorial: Mobilities, Immobilities and Moorings,” Mobilities 1, no. 1 (2006): 1–22; John Darwin, The Empire Project: The Rise and Fall of the British World-System, 1830–1970 (Cambridge: Cambridge University Press, 2009): 113–14. Alan A. Brookes, “The Golden Age and the Exodus: The Case of Canning, Kings County,” Acadiensis 11, no. 1 (1981): 62 Stephen J. Hornsby, Time and Tide: The Transformation of Bear River, Nova Scotia, Northeast Folklore 31 (Orono: Maine Folklife Center, 1996), 20, 28–29; Larry McCann, “Seasons of Labor: Family, Work, and Land in a Nineteenth Century Nova Scotia Shipbuilding Community,” The History of the Family 4, no. 4 (2000): 489, 492. Gregory Cushman’s recent book is an exceptional example of a global history that weaves together individual biographies, local histories and the global history of a commodity: Guano and the Opening of the Pacific World: A Global Ecological History (Cambridge: Cambridge University Press, 2013). Hornsby, Time and Tide, 21–25; McCann, “Seasons of Labor,” 508–17. This statement must be qualified by the recognition that relatively few local studies of similar communities have asked similar questions. Larry McCann, however, suggests in “Seasons of Labor” that important affinities may exist between Maitland and Weymouth, Nova Scotia. Based on most studies to date, which emphasize local and regional connections, Maitland’s pattern appears unique. Hornsby, Time and Tide, 20–33. ten kilometres from the college town of Wolfville, and less than thirty kilometres from Windsor and Parrsboro, another important shipbuilding village. Bear River was only ten kilometres from Digby. The key point here is that Maitland was not as well located in relation to major population centres as these other shipbuilding communities. William Beinart and Lotte Hughes, Environment and Empire (Oxford: Oxford University Press, 2007), 1–22; John Tully, “A Victorian Ecological Disaster: Imperialism, the Telegraph, and Gutta-Percha,” Journal of World History 20, no. 4 (2009): 559–79; Graham, “Ascendancy of the Sailing Ship”; Sandip Hazareesingh, “Editorial: Commodities, Empires, and Global History,” Journal of Global History 4, no. 1 (2009): 1–5; J.W. Moore, “The Modern World-System as Environmental History? Ecology and the Rise of Capitalism,” Theory and Society 32, no. 3 (2003): 307–77; Edmund Burke and Kenneth Pomeranz, eds., The Environment and World History (Berkeley: University of California Press, 2009), 3–32. Thomas Miller, Historical and Genealogical Record of the First Settlers of Colchester County: Down to the Present Time (Halifax: A. & W. Mackinlay, 1873), 342. Judy Burns interviewed a local history enthusiast, the late Roy Rhyno, in early 2011, before he passed away. No archival records appear to exist that might support or deny this contention. 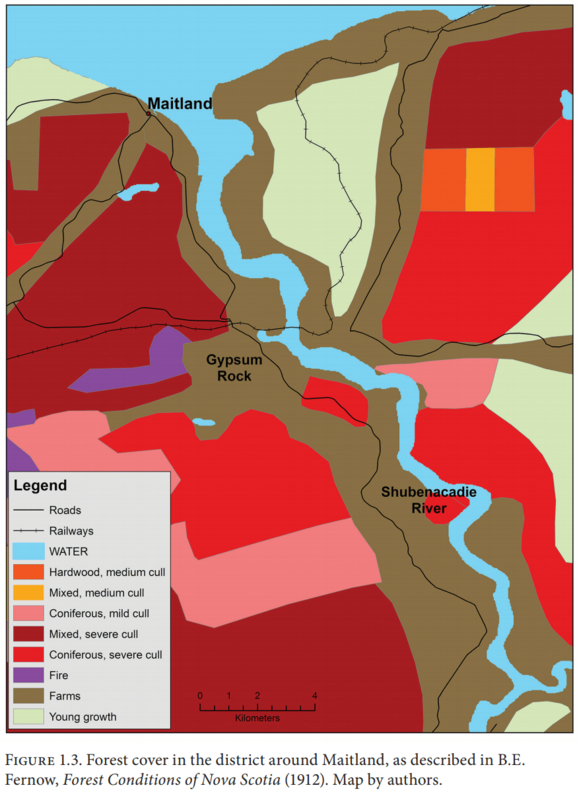 Limestone was interspersed with the gypsum on this map, and the coal deposits were primarily located across the bay on the Chignecto Peninsula. These are not shown on the map. Donna Barnett, River of Dreams: The Saga of the Shubenacadie Canal (Halifax: Nimbus, 2002). Gerald S. Graham, “The Gypsum Trade of the Maritime Provinces: Its Relation to American Diplomacy and Agriculture in the Early Nineteenth Century,” Agricultural History 12, no. 3 (1938): 209–23. Census of Nova Scotia (Halifax: E.M. McDonald, 1862), 231. Charles A. Armour, “Lawrence, William Dawson,” in Dictionary of Canadian Biography (hereafter DCB), accessed 15 August 2015, http://www.biographi.ca/en/bio/lawrence_william_dawson_11E.html; supplemented with information from unpublished, handwritten notes collected by and for staff at the Lawrence House Museum since it opened in Maitland in 1971. Clara Ingram Judson, Donald McKay: Designer of Clipper Ships (New York: Scribner, 1943); Richard Cornelius McKay, Some Famous Sailing Ships and Their Builder, Donald McKay (Riverside, CT: 7 C’s Press, 1969); David R. MacGregor, Merchant Sailing Ships 1850–1875: Heyday of Sail (Annapolis, MD: Naval Institute Press, 1985). J.W. Moore, “‘Amsterdam Is Standing on Norway’ Part II: The Global North Atlantic in the Ecological Revolution of the Long Seventeenth Century,” Journal of Agrarian Change 10, no. 2 (2010): 188–227; Beinart and Hughes, Environment and Empire. McCann, “Seasons of Labor,” 489–90. W.L. Burgess, “List of Vessels Built along the Shubenacadie River and Its Confluence with Cobequid Bay,” 1950, MG29 A23, Library and Archives Canada, Ottawa (hereafter LAC). We used two types of sources in order to understand shipbuilding in Maitland. Specifically, we used this list—compiled in 1950 of ships built in the region—in tandem with the ship registers for Maitland and Windsor in order to compile an inventory of the ships built during the second half of the nineteenth century and their tonnage. Our list is incomplete. It is likely that analysis of the registers at larger ports (e.g., Saint John, Boston) would yield more vessels, but this research would be time consuming and likely yield only a handful of additional vessels. We are confident that the sources examined for this paper demonstrate the broad trends of Maitland shipbuilding. See McCann, “Seasons of Labor,” 490–91, esp. fig. 1. On the interconnection between the timber trade and shipbuilding, see Eric Sager and Gerald Panting, Maritime Capital: The Shipping Industry in Atlantic Canada, 1820–1914 (Montreal/Kingston: McGill-Queen’s University Press, 1990), 36–40. Sager and Panting, Maritime Capital, 60. Annual Returns of Trade and Navigation for the Province of New Brunswick in Journal of the Legislative Council of the Province of New Brunswick, (Fredericton: G.E. Fenety, 1864), 4. Eric W. Sager and Gerry Panting, “Staple Economies and the Rise and Decline of the Shipping Industry in Atlantic Canada, 1820–1914,” in Change and Adaptation in Maritime History: The North Atlantic Fleets in the Nineteenth Century, ed. Lewis R. Fischer and Gerald Panting (St. John’s: Maritime History Group, 1985), 22. See McCann, “Seasons of Labor,” 491, for a useful map illustrating the dominance of Hants and Kings counties in the Maritime shipbuilding industry. This conclusion needs to be qualified. The sparse nature of the documentation means it is nearly impossible to compare these villages directly. It is clear that both the Maitland and Windsor shipping registers are incomplete. Key vessels, such as Lawrence’s Pegasus, do not appear in these registers despite having been built in Maitland. Table 1.1 represents all of the ships we have been able to determine were actually built in Maitland, whereas table 1.2 represents the ships listed in the Windsor Shipping Registers. There may have been ships built in these ports that were not listed. Census of Nova Scotia (Halifax: E.M. McDonald, 1862), 52; Census of Canada, 1870–1871, vol. 1 (Ottawa: I.B. Taylor, 1873), 73. People born in Nova Scotia consistently comprised about 95 percent of the province’s population throughout the entire period under study. See Census of Nova Scotia (1862); Census of Canada, 1870–1871, vol. 1; and Census of Canada, 1880–1881, vol. 1 (Ottawa: McLean, Roger & Co., 1882). The total amount of improved land in 1870 was 10,479 acres. Se Census of Canada, 1870–1871, vol. 3 (Ottawa: I.B. Taylor, 1875), 91. McCann’s work draws on a similar source — the business records of Colin Campbell Jr., a leading shipbuilder in Weymouth. W.D. Lawrence Papers, MS4-8, Dalhousie University Archives, Halifax (hereafter Lawrence Papers). Specific references to these practices are found in the following correspondence, all from 1867: Lawrence to Black Brothers, 15 June, 15 July, 1 August, 2 August, 13 August, 27 August, 4 September, 20 September; Lawrence to Joseph Howe, 14 June; Lawrence to J.C. Jones, 16 July, 31 July, 27 August, 5 October, 9 November; Lawrence to George B. Vaughan, 16 July; Lawrence to J. Shaw, 31 July; J.W.M. Irish, 2 August, 9 September, 23 September; Lawrence to James Caffrey, 20 August. The final outfitting at Saint John may explain why the Pegasus was not registered in Maitland. Interestingly, Stephen Hornsby suggests that shipbuilders in Bear River usually ordered wood for masts from the Pacific coast. Oregon pine or British Columbia Douglas fir would often be shipped to—and then outfitted onto the ship — in Saint John. See Hornsby, Time and Tide, 25. The parallel between Colin Campbell, developed by McCann, and W.D. Lawrence, developed here, seems quite apt and points to some similarity between Weymouth and Maitland. See McCann, “Seasons of Labor,” 492; and Charles A. Armour, “Campbell, Colin (1822–81),” in DCB, accessed 14 January 2015, http://www.biographi.ca/en/bio/campbell_colin_1822_81_11E.html. Lawrence Papers. Information on these contracts can be found in many letters written by Lawrence between 1868 and 1874, including letters to Black Brothers, A. Gibson, W.R. Grace, J.C. Jones, John Pirie, and W. Russell. Marvin Moore, “William D. Lawrence: Another Perspective,” The Occasional 9, no. 3 (1985): 198. Acadian Recorder, 21 February 1873, cited in Moore, “William D. Lawrence,” 198. Information from unpublished, handwritten notes collected by and for Lawrence House Museum guide staff. This model is preserved in the Lawrence House Museum. Lawrence to James Ellis, 20 February 1874, Lawrence Papers. Barbier, Scarcity and Frontiers, 2–3, 368–428. Eric W. Sager and Lewis R. Fisher, Shipping and Shipbuilding in Atlantic Canada, vol. 42, Historical Booklets (Ottawa: Canadian Historical Association, 1986), 8. Frederick William Wallace, Wooden Ships and Iron Men (Toronto: Hodder & Stoughton, 1924), 192; McCann, “Seasons of Labor,” 491. The census data for shipbuilding is focused on the county; unfortunately, no more specific information for this period exists. Windsor and Hantsport were also major shipbuilding centres. In 1870, Hants County had 100 seagoing vessels, with a total tonnage of 45,414 and average tonnage of 454; Digby had 116 seagoing sailing vessels, with a total tonnage of 17,200 and average size of 148; and Yarmouth had 246 vessels, with a total tonnage of 81,878 and average size of 332. Digby had one small steam vessel and Yarmouth had two average size vessels. Shelburne had 130 vessels, but they were fairly small (average 80 tons), and Lunenburg had 162, with average size of 54 tons. The smaller vessels on the Atlantic coast reflect the important place of fishing in the region. See Census of Canada, 1870–1871, vol. 3, 16–17. McCann presents a slightly different perspective, in “Seasons of Labor,” fig. 1 (“The Economic Geography of Shipbuilding in the Maritimes and the Bay of Fundy Region, 1871”). Consulting the manuscript version of the 1871 census to examine the average value produced by shipyards in the Maritimes, McCann demonstrates that yards in Kings, Shelburne, and Cape Breton (as well as Saint John) produced greater value than those in Hants County, but that shipbuilding was of greater importance to the overall economy in Hants County than in these other parts of the region. See McCann, “Seasons of Labor,” 491; and Census of Canada, 1870–1871, vol. 3, 396–97. McCann’s analysis is built specifically on the “Manuscript Industrial Census Schedules for Counties in New Brunswick and Nova Scotia, 1871” rather than the published versions we consulted; the 1871 manuscript census is now available in digital form on the LAC website, accessed 19 December 2014, http://www.baclac.gc.ca/eng/census/1871/Pages/about-census.aspx. Information for Hants County can be found on digitized reels C-10395 and C-10540. Both Lawrence and his daughter, the wife of James Ellis, travelled occasionally on these ships. Lawrence Papers; W.D. Lawrence, untitled travel memoir, n.d., 1–23, Nova Scotia Archives and Resource Management, Halifax (hereafter NSARM). Superphosphates, created by mixing animal bones with sulphuric acid, started to dominate the fertilizer market in the early 1870s. Frederic Vallve, “Guano,” in Encyclopedia of World Environmental History, ed. Shepard Krech (London: Routledge, 2004), 628; W.A. Parks, “The Development of the Heavy Chemical Industry of West Ham and District,” (MA thesis, University of London, 1949); Lawrence, untitled travel memoir, 20–23. W.D. Lawrence, unpublished manuscript, 22–23, G420 L42, NSARM; Archibald MacMechan, “The Great Ship” (Halifax: Nova Scotia Museum, 1967), 7–8. The MacMechan article was originally published in Dalhousie Review 8, no. 2 (1928). Census data for this period varies in reliability. Population numbers depend on the time of year of enumeration, quality of enumeration, and boundaries used to define the Maitland area. Maitland, Nova Scotia Registrar of Shipping. Spicer, Masters of Sail, 57. Maitland, Nova Scotia Registrar of Shipping. One additional vessel is listed here that does not appear in table 1.1. The overall tonnage for Charles Cox’s Julia and Spartan is not listed in the shipping registers and therefore was not included in the table listing tonnage. Wallace, Wooden Ships and Iron Men, 276. See Census of Canada, 1870–1871, vols. 1–2 (Ottawa: I.B. Taylor, 1873); Census of Canada, 1880–1881, vols. 1–2 (Ottawa: McLean, Roger & Co., 1882); Census of Canada, 1890–1891, vols. 1–2 (Ottawa: S.E. Dawson, 1893). J. Loo and N. Ives, “The Acadian Forest: Historical Condition and Human Impacts,” Forestry Chronicle 79, no. 3 (2003): 466. B.E. Fernow, Forest Conditions of Nova Scotia (Ottawa: Department of Crown Lands, 1912), 42. Probate records can be found in the Probate Office at the Kentville Justice Centre, Kentville, NS. In addition to a number of smaller vessels, Joseph Monteith built the Senator, Gloaming, and Grandes; Alexander Roy built the William Douglas, Eastern Roy, and W.J. Stairs; William Lawrence built the William D. Lawrence; and Archibald McCallum built the Joseph, all of which were over one thousand tons. McCallum’s probate record shows that he held stocks, savings, and a number of local mortgages. Fazley Siddiq, “The Size Distribution of Probate Wealth Holdings in Nova Scotia in the Late 19th Century,” Acadiensis 18, no. 1 (1988): 141. Interpretation 1: Maitland's Moment by Sean Kheraj and Tom Peace is licensed under a Creative Commons Attribution-NonCommercial-ShareAlike 4.0 International License, except where otherwise noted.